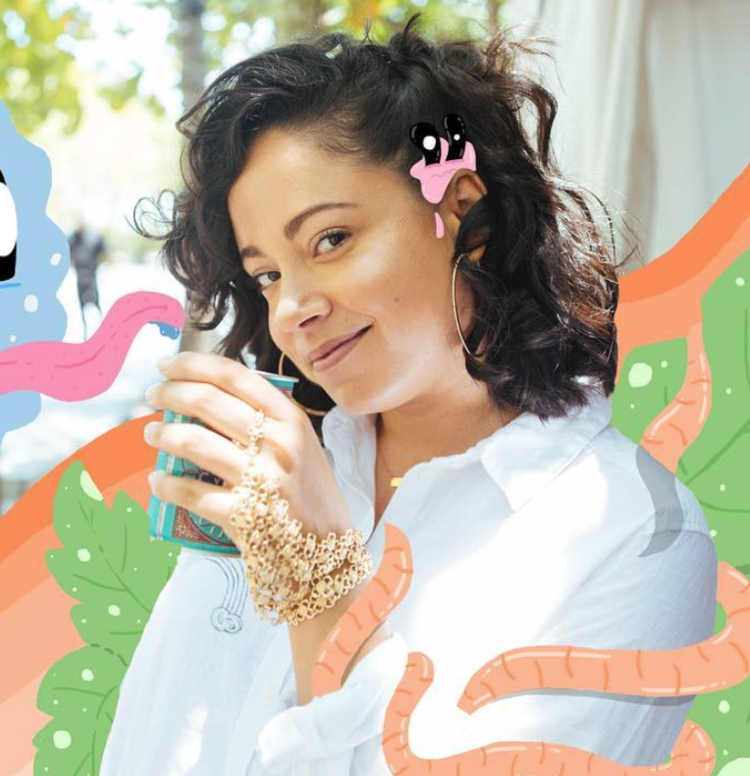 Graphic designer, illustrator and all around creative D’ana Nuñez is #LatinaMagic. Born in Miami and raised between Lakeland and Puerto Rico in a family of artists. The path to her career was not always clear. She started in the fashion world but eventually made the switch to graphic design. Now, she’s collaborating with brands like Champs, artists like Sampha and even dropping a sticker pack for iMessage this month. With no plans on slowing down we spoke to the lady boss about the freelance grind and how she eventually made the leap to work for herself. O1S: How did illustration and graphic design find you? D'ana: Through the power of suggestion. My fiancé told me three years ago that he thought I was in the wrong industry and should find something that compels me. At first I was hurt because I spent all this time in the fashion world and thought it was what suited me best. I outgrew that industry but still had an itch for storytelling and three years later here I am. O1S: What about stop motion? D'ana: With everything else that I obsess over, I wanted to challenge myself to take on a different piece of media. O1S: What type of design/work clients are asking the most from you? D'ana: Last week? Stop motion. This week? Mixed media. Tapping into different mediums has its perks but you start to notice everyone wants in on it too so it’s no longer a sport and more like a service. O1S: What do you think about South Florida and working in this market? D'ana: It’s growing and just like anywhere else, it has its flaws and its pros. My least favorite thing about Florida in general is that clients don’t understand the true value of what artists like me bring. If you want to make good money then you’re better off living in L.A. or N.Y. I pitch myself to brands a lot and I stay connected with like-minded individuals. O1S: Many creatives share the same sentiment…how do you find work opportunities as a freelancer? D'ana: I pitch myself to brands a lot and I stay connected with like-minded individuals. I would say that I finesse, but I honestly just do what I do best and that’s being the best version of myself. O1S: Who are some of your clients? D'ana: Name dropping makes me cringe lol… but I will say I do have some of the best clients. Haha, that’s fair. O1S: What has been one of your favorite projects to work on then… and what brands or individuals would you like to work with next? D'ana: I usually lie when asked this question but I think it’s time for me to say that I don’t have a favorite yet. I’m actively searching for THE ONE, you know? I want to get in making more tangible things. I want to get my hands dirty and learn a skill. I always wanted to design a series of sneakers, but then again I’ve always wanted to design my own line of home goods so we’ll see where the universe pulls me toward first. O1S: I guess that’s the life of the creative. How was the transition from working on your art part-time to working full-time for yourself? D'ana: Transitions are always tough and for me it was only a matter of time before I began to feel that I could grow and expand well on my own. A lot of it had to do with believing in myself. I would literally talk myself into going freelance full time, the best pep talks I had were during those times. In theory, social media is super powerful and it has contributed a lot of opportunities and challenges. O1S: Your Instagram is curated and true to your aesthetic. How have you leveraged social media for your brand and how has it influenced your business? D'ana: In theory, social media is super powerful and it has contributed a lot of opportunities and challenges. Yet I recently had to take a little step back to remind myself that I don’t, nor should I get in the habit of creating for social media, but should create for myself and sometimes that line can get a little muddled. D'ana: I take a lot of walks or bake at the beach, four walls can make you a little stir crazy. O1S: Who else is creative in your family? D'ana: My brother, sister and dad are pretty damn good. Growing up I didn’t think anything of it though but I guess it rubbed off on me. O1S: What’s next for you? D'ana: I’m going to be releasing a sticker pack for iMessage sometime this year and other good stuff that I’ll just wait to show you all when it’s out! Thank you!